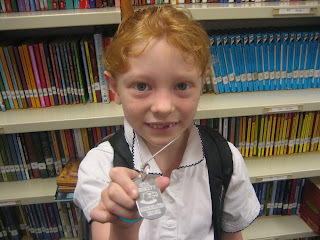 In her quest for a silver AR reading dog tag, Abigail has joined the high society of reading millionaires. At CTA, once you read a million words, you become part of the school "Millionaire's" club. She got this nifty certificate, and her name on a big poster in the library. The honors even extend to a personal selection of your favorite bookmark. Oh yes. Whatever it takes to motivate, I'm all for it. Part of the million words are made up of books called "Pony Pals," which seem like the "Sweet Valley High" of reading for the 2nd grader, but she likes it. She has dabbled in Little House on the Prairie books, and even a few classics like "National Velvet" and "Black Beauty," - notice the horse theme - and we're still looking for more. She and Matthew are reading "Journey to the Center of the Earth" for bedtime story, and her teacher recommended "Mr. Poppers Penguins." I could hear her giggling while she read it. Must be a good book! I think "Clementine" is up next, but if you know of any suggestions we are all ears. She burned through the "Captain Underpants" books pretty quick, and really enjoyed the "Hank the Cow Dog" series. We teased her quite a bit about those: "So are you reading Hank the Frog Duck?" She always corrects us, not realizing that we are just twitting her . . . tee hee! That is great news - great little reader. I am just glad Lindsay is no longer terrified of AR tests! Some of Aspens favorites are the rainbow magic series, magic tree house, Junnie B. Jones and I think it's called Frannie B. Stein. I love that our kids are old enough to enjoy reading a book on their own! I'm so proud of lil' Abigail! Those were the same books that Erin Finlayson would read. Has she read "Abigail takes the Wheel"? It's actually historical fiction. LOL, I love it when you twit her! "I already KNOW that MOOOOM!!!" Unfortunately I don't have any suggestions but I had to say that now I miss my little Abi-girl! CONGRATULATIONS ABIGAIL! We are SOOOO proud of you! Books are never a waste of money, and reading is never a waste of time. Keep it up! We love you!